Leaves: Blades shorter than to about equaling culm, 6 to 26 inches long, 1/8 to 2/5 inch wide. Inflorescences: Spikes, 3-12, dense, globose, 1/5 to 4/5 inch diam., terminating unequal peduncles; subtending bracts 4-7, leaf-like, the longer much exceeding the inflorescence. Spikelets: 60-110+, narrowly linear, 1/8 to 2/5 inch long, radiating in all directions from a central point, 2-4-flowered, spikelet bases overlapping, tips pointed; scales 3-5, yellowish brown, midrib green, 7-11-nerved, narrowly oblong-elliiptic ca. 1/6 inch; stamens 3; style 3-cleft. 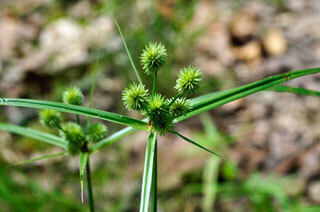 Fruits: Achenes brown, narrowly oblong, .07 to .09 inch long, to .002 inch wide, bluntly 3-angled, shiny. Habitat: Openings of dry, upland wooded areas, roadside ditches, dry, open disturbed areas, usually in rocky or sandy soils. Distribution: South 1/2 of the east 1/3 of Kansas.